This kitchen tap's pull-down shower head offers professional cleaning power to take on any task, even the piles of dirty pots and pans created by a special occasion dinner. Add a spout with 100° swivel action and built-in GROHE SilkMove technology powering the single-lever mixer's effortless glide, and you have all the range and power you need to keep your kitchen tools and work areas sparkling with minimum effort. Our easy installation system makes fitting quick and trouble-free. Designed with the demanding amateur chef in mind, its aesthetic is a series of subtle forms. 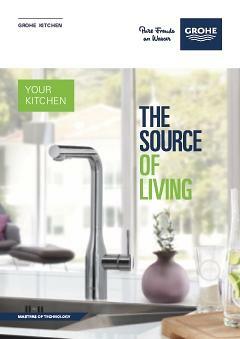 Presented in dazzling GROHE StarLight chrome, it will remain your kitchen's lustrous focal point for years. Thre perfect mix of sleek design and practical features.